The second album is in the works so there's few gigs atm. I'm available for booking though. A first glimpse into the pre-production of the new album, probably entitled Music for Adventure but also probably not. Forthcoming 2019! Existentialist hippie minnesänger / doomsday poet / blues lutenist. Georg Tkalec -however that is pronounced- is a composer and performer of music and stories. 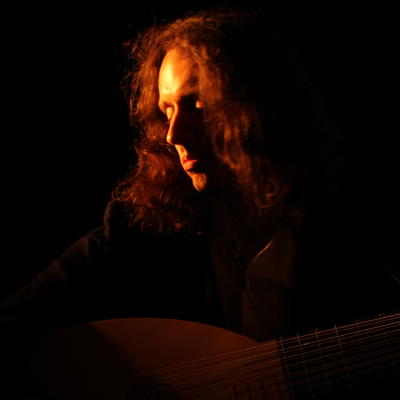 He dwells in Klagenfurt, Austria, plays the lute and sings with a high voice. Surfaced 1986, tkalec already has quite a variety of tries and errors under his belt: starting to write songs at the age of 6, he quickly and easily moved through genres and styles over the years with the naturality only inherent to genius and/or madman: be it as lead-bass player and shouter alongside a sole djembe in his first death metal duo (fact. ), walking up and down the fretboard with various jazz formations, locked up in his chambers endlessly staring into Cubase writing and producing for Tin Man Falls, writing down the notes for his very dramatic opera ‘Balmung‘, or jumping up and down the stage with the fake ID Djordje Panslavistic with band Roy de Roy. Time however has made it clear for him that there is only so much one can do, and so rather than try and imitate others, tkalec now ventures to explore the music in his own mind only. His influences are of a wide variety, they start with psychedelic rock stuff like Hendrix and early Pink Floyd to Doors and Led Zeppelin, take a strange turn at contemporary drum n bass artists like Noisia, Phace and Misanthrop, range back to Bartók and Mahler, highlight Frank Zappa, include Miles Davis, James Brown and Ravi Shankar, expand to William Blake, Nietzsche, Melville, McKenna, Rumi and Poe, and don’t stop there. But be aware, they could include you. tkalec’ lyrics tend to tell stories or reflect on mostly existential themes (as being the last of importance left within the well-fed decadence of first world where it is found inconvenient to sing about terrors unfelt) in an sometimes black-humourous and critical way, hence forming a bouquet of meaning and death, mythology and absurdity, criticism and comedy – spiced with questions and dry of answers. For inquiries of all sorts and booking, please contact info [at] tkalec.cc. 'The unpronounceable master of the post-modern Renaissance lute tkalec returns after his full-on debut album Stowaway with another five pieces settled somewhere between folk-rock frenzy and pop poetry. Journeys through wayward music realms - mixed by tkalec for Alternate Audio. A take on Frank Zapps's classic My Guitar Wants To Kill Your Mama with Sitar and Renaissance lute. The debut album Stowaway. Out for a while now on Alternate Audio. Although the mere notion of a lute playing singing songwriter alone is frightening to some, we nevertheless present the full sonic recreation of this strange compound history put together in tkalec‘s inaugural 11-track journey Stowaway that spans three-quarters of an hour. The digital album also comes with a very (trust me, very) colourful 48-page pdf booklet that includes all the lyrics and many illustrations, all thoroughly amusing and/or disturbing. The booklet is also available in real through the Alternate Audio Store. or any other good store. Looking to redeem a download code?